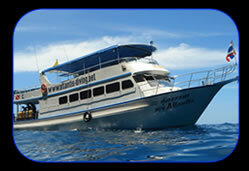 Scuba Diving - Atlantis Diving, Koh or Ko Lanta island, Krabi, Thailand. Koh Lanta is a tropical Island and is located about 70 km south of Krabi's western Coast on the southern Andaman Sea . The quiet, laidback atmosphere offers an ideal get away for those seeking to escape from the masses of Tourists. Very rich of Nature, Koh Lanta offers a dozen of high quality Dive Sites, a good choice of Resorts and Hotels, ranging from the romantic bamboo Bungalow up to the luxury 5 star Resort, most of them are located directly at one of the 9 secluded Beaches on it's western Coast. On the very south of the island you will find a big National Park inviting for walks in a tropical Rain Forest. Atlantis Diving was established in 1993 as one of the first diving schools on Koh Lanta and is successfully managed by a German/Swiss Partnership. Our Office with own Peer is situated in Saladan, from where we conduct daily Trips to various Dive Sites within the Southern Andaman Sea. We also offer a wide range of PADI Dive Courses from: Discover Scuba Diving up to the degree of an Assistant Instructor as well as many specialties.